Leadership Behaviors: Just how do you become a resilient and inspirational leader? Of all leadership behaviors, resilience is the one which is most commonly needed and least commonly developed. Leading your people through a period of change can feel like walking a tightrope with an elephant on your back. Resilience is what gets you – and your elephant – to the other side. Forward Focus>>Inspire Leaders>>Leadership Behaviors: Just how do you become a resilient and inspirational leader? Disruptive, inspirational leadership works to avoid complacency in the workplace. It creates the environment of creativity and innovation that drives an organization forward. Yet disruptive leadership is a difficult leadership behavior. You’ll face resistance from people who believe that change is unnecessary, and that their knowledge of the business is incontrovertible. The evidence that you produce to support your strategy will only serve to alienate you further. 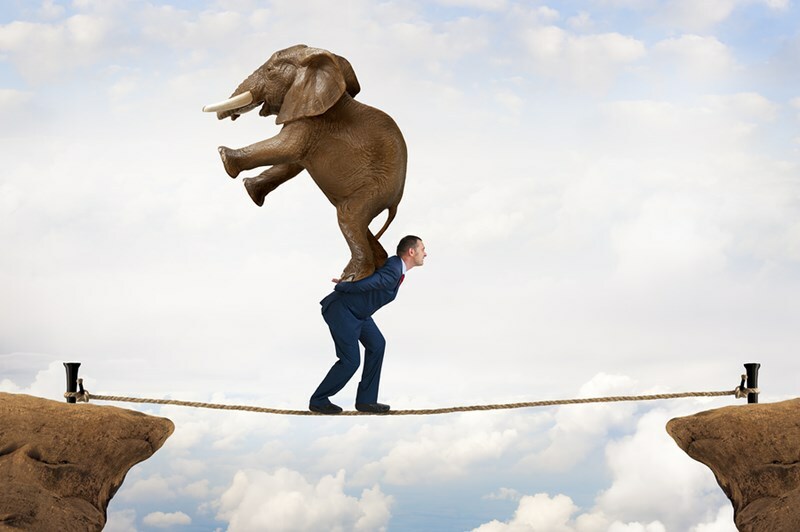 Leading your people through a period of change can feel like walking a tightrope with an elephant on your back. As you face the challenges of disruptive leadership, the behavior of others toward you will appear personal. Promoting a new culture, working practices and procedures requires the leader to develop an inherent behavior: resilience. In this article, we discuss five key behaviors that will enable you to recover quickly from difficulties and setbacks, and empower you to face challenges head on as you overcome resistance to change. We are all human. We make mistakes. It’s how we handle them that matters – both our own mistakes and those of others. Forgive mistakes, and learn from them. Help others to overcome their errors, including the error of misjudging you. Understand your emotional responses, and learn to regulate your behaviors in any given situation. Doing so will make you less temperamental, and your ability to carefront rather than confront in a situation of workplace conflict will mark you out as an even-handed, objective leader. Understanding yourself is the first step to understanding others. We all need a guiding light, someone with whom we can discuss the trials of our working life. An objective view from someone who understands the inner you, too. A mentor who can empathize and advise is an invaluable resource. He or she will help to give perspective to your judgement, challenge your perceptions, and increase your self-awareness. We all need an outlet. Time for ourselves, away from work. For many, spare time is filled by doing chores around the home, caring for the kids, or having a drink with friends. There’s nothing wrong with this, but consider finding a pursuit that totally absorbs you in a different way. This might be painting, fishing, or any activity that removes you entirely from your ‘normal life’. You may also choose to undertake an activity that will enhance your success as a leader. Perhaps volunteer at a hospital, or take a position in your city council. Doing something different that relaxes you or challenges you in different ways is important. You need to relax and refresh. In addition to having an outside pursuit, make sure that you take care of your body, mind and spirit. Eat well and exercise regularly. Commit time to your family and friends, and stick to it. You’ll be a better leader, more able to focus on business strategy and planning. A healthy, well-balanced personal life will help you make healthy, well-balanced decisions in your professional life. Resilience is an inherent human trait, but not all people are equally resilient. Developing emotional intelligence will help develop resilience – and this is the key to the journey of successful disruptive leadership.